Ksh. 4M toilet constructed in Homabay raises eyebrows to the residents over County misuse of funds - Bana Kenya News, Real African Network Tubanane. Homabay Residents in mixed reactions over crooked county officers whom they have now turned on the county residents projects, embezzle and misuse of the county funds openly. The county government has been accused of bad leadership from the governor Cyprian Awiti. 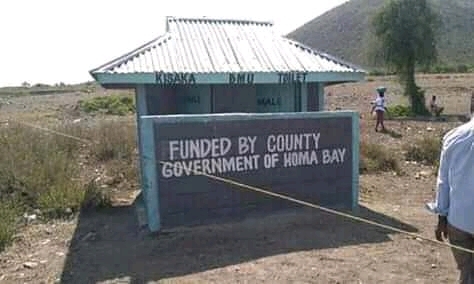 The county government managed to construct 10 public toilets in the major towns of the Homabay county. They also managed to construct other public toilets in the villages or small town which cost 8 Million and 4 Million for village toilets respectively. The residents were shocked after they got the figures from the county officials and how the public toilets were constructed. "If this is what is called devolution then it is better we to abolish it and be back to the National government. A toilet that can be constructed with less than one hundred thousand, they constructed it with 4 Million." Olunga Denis responded to the media. The county government officials declined to comments on the accusations. They said EACC will be the one to note the shortage and fraud in the county. Homa bay town MP Peter Kaluma has been accused of colluding with the Governor to syphon county funds. The Homabay residents now cry for their county officers who have turned the government to a source and playground for syphoning funds. The residents want EACC to visit the county and investigate the financial matters and businesses done behind the curtains.